On weekends (Saturday and Sunday) in Mir Castle entrance tickets 14 BYN for adults and 7 BYN for children, in the Nesvizh Palace 16 bel. rub. for an adult and 7 bel. rub. for a child. The world – the town with a silent cosiness of streets where throughout centuries destinies, culture and life of Belarusians, Poles, Roma, Tatars, Jews closely intertwined. On the suburb of the town the medieval giant - Mir Castle Complex important settled down. Majestic towers and powerful walls are harmoniously combined with the beautiful park, being reflected in a pond mirror. The halls ornated by a carving and gilding, graceful furniture, abrupt ladders on which you not just will pass – you will turn into other reality, in other century. Chapel – a ladder which will spend you from powerful walls of the lock to magnificent parks. In it the embodiment of modernist style style, so popular in the 19th century, - any symmetry and classics – a new view on architecture, fresh receptions and forms. This place chose also a lock ghost – Sonechk who, among others, is buried in a tomb. 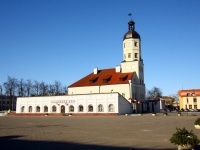 In the center Nesvizha the fine example of architecture of the 16th century – a city Town hall – self-government institutions is located. She can tell you all mysteries of the medieval city and citizens: here the court was managed and sentences were pronounced, there was a city archive and treasury, control scales were stored here, and nearby there took place fairs. Heart of the oldest Town hall in Belarus and fights today rhythmically – each 15 minutes from a high tower remind of time hours. The house of the handicraftsman or lodge in the market located at the market square, undoubtedly draws attention – there are no others such, not only in Nesvizhe, but also Belarus. And 3 centuries ago building of the area around a town hall quite so looked: lodges of handicraftsmen with graceful baroque facades which, as if a maple leaf, elegantly cover a 2-skatny wooden roof. The house in the Market - the only example of city housing of the first half of the 18th century which has remained in Belarus with a peculiar baroque facade. Nikolay Hristofor Radzivill Sirotka who has got a good education in Europe and his wife Elzhbeta Evfimiya from Vishnevetsky' family who for beauty and mind was often called "the Savsky queen" and in Nesvizhe sought to develop formation of the European level. At the initiative of Evfimiya, in 1596 in Nesvizhe the female Catholic monastery, the first in the territory of Belarus, has been founded. Here girls from the shlyakhetskikh of families studied. The tradition of education stands out through all history of the city - and thread isn't torn off. 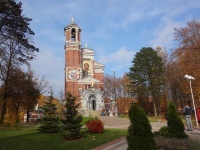 Today in the building of the monastery the Nesvizhsky state college of Yaqub Kolas is located. She for centuries met dealers and handicraftsmen, poets and composers, princes and kings. Or not it? At the end of the 16th century it was possible to get to Nesvizh through one of 5 gate – other options were not. Up to now only one remained – Slutsk. Whether often to you gate to the city meet? Is not present? Then surely make a photo for memory and make a wish, having passed through them. "Bow to your temple in your fear" - meets by these words parishioners a majestic and God's monumental Nesvizhsky church of a body. Built in the 16th century, it became the first in the Polish-Lithuanian Commonwealth temple in Baroque style: magnificent frescos, pictures, marble and gilding. Under a church the crypt Radzivillov – тревья in Europe a tomb by the number of burials settled down. Really atmospheric fascinating place. It is stale – one of the oldest and most mysterious cities of Belarus where there is the well-known Nesvizhsky palace. In the 16th century beauty and magnificence of finishing it competed with many royal palaces: a parquet from the most valuable breeds of a tree, the unique finishing of a ceiling, walls covered with gilding. This really mystical place and one of the most mysterious in Belarus within the walls of which looks for calms of a shower of Barbara Radzivill – the Black lady Nesvizha. 11-April-2019 Отправили заявку по ватсап, нам выставили счёт, мы оплатили и утром следующего дня поехали на экскурсию. Экскурсовод очень понравился. Все профессионально, интересно, грамотно, чувствуется что экскурсовод здорово владеет предметом и ему самому нравится эта работа. Мы считаем что нам очень повезло. 21-February-2019 Экскурсия хорошо организована, начиная с момента оформления заказа. Грамотный эрудированный эксурсовод, который любит свою работу, отличный автобус, интересная программа экскурсии . Понравилось, что экскурсия хорошо спланирована по времени. Захотелось много чего почитать самой после экскурсии. 06-January-2019 Тур получился замечательным, во многом благодаря отличному гиду. Потрясающая экскурсовод! Очень грамотно организовывала экскурсию, нам везде хватало времени, никуда не спешили, но шли точно по расписанию.